Here is Wave Study #15 which I painted a few days before Christmas. It was a cold sunny day between storms. The day did cloud over and while I got some lovely bright light on the waveforms, The water was not sparkling all that much due to the choppy waves and the long angle of the sun. As you can tell, I am still pursuing some of those cross waves. This time the waves seemed to be twisting and folding into each other. Always changing it is. I guess that is part of what fascinates me so. Looking at this painting now after not really looking at it for a couple of days tells me I need to work on the broken wave form, the white part which is to say, the breakers. I would like to capture a bit more of the variation in shape and add a bit more of a value range. Value in the white foamy waves is a very subtle thing but I know it is there because I see it. I will have to make a list of areas to focus on. Breaker shape and value will be added to it for sure. This will be a short post as we are busy with the family and memorial services and all. 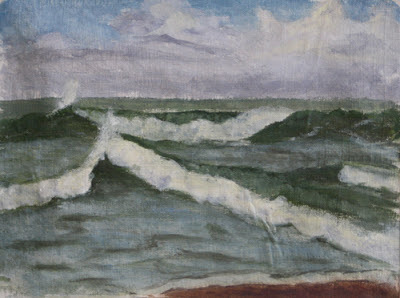 I am champing at the bit to ratchet up my production and create paintings for sale as well as the wave studies. To that end since misery loves company...er that is, since it is lovely to have companions and teammates, I have decided to join artist and art marketing enthusiast Leslie Saeta in her 30 paintings in 30 days challenge starting January 2, 2013. I should have a few things to post about in January! I probably will not have another post until the first or second, although I may have a surprise post. Wishing everyone a happy, healthy, and productive New Year! How exciting. You are starting 2013 off with a bang!